Paul Manafort, Roger Stone, Jerome Corsi…could Trumpville’s cast of characters be anymore sleazy? This week on The Halli Casser-Jayne Podcast Halli and her partner in politics veteran White House correspondent Matthew Cooper talk Manafort, Stone, Corsi, GM’s job cuts, climate change, Trump’s border war and so much more with their fresh take on the week’s news, the podcast posted on all your favorite sites and apps and at Halli Casser-Jayne dot com. As we they every week, newsman Matthew Cooper joins Halli for their politics segment, PODCAST AMERICA, in which Matt and Halli slice and dice all things politics. And what a week it has been. The Central Americans have come and Trump treated them, including mothers and children, to a ‘healthy’ dose of gas, Paul Manafort allegedly met with Julian Assange just as he became the Trump campaign’s chair, and right before WikiLeaks leaked the infamous Hillary Clinton emails. The Trump Administration issued a devastating climate report, which Trump, like the Wizard of Oz told Dorothy to do, told the American public to do: ignore the facts. Oh, and did we mention that Miki Brzezinski became Mrs. Joseph Scarborough? It was just another week in the storied presidency of Donald J. Trump. Welcome to The Halli Casser-Jayne Show and they’re just beginning. 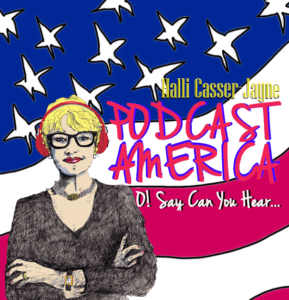 Paul Manafort, Wikileaks, Julian Assange, climate change, unarmed migrants, GM cutting jobs, Nancy Pelosi, racism in Mississippi — join journalists Halli and Matthew Cooper for a fun and insightful political discussion on The Halli Casser-Jayne Show, the podcast posted at Halli Casser-Jayne dot com.